Finding a great place to eat in London is not difficult. As one of the leading food capitals in the world, food is never going to be hard to find. If you are looking for somewhere different to eat in London, however, they can be a little trickier, if you aren’t a local. Searching Google for places to eat in London will turn up a seemingly never-ending set of options. But what if you don’t want to eat at Gordon Ramsay’s newest restaurant? Or you don’t fancy eating at a three-star Michelin location? You don’t want chain restaurants either, but you want somewhere that serves casual, easy to eat food in a great location, with an even better background story. If so, keep reading for three great locations that we loved to eat and drink at in London. I love mentioning Gordon’s Wine Bar to English locals who often don’t know that London’s oldest wine bar is in such a prominent area. Many I have mentioned it too have walked past, often, with nary a thought as to the historical significance. I can’t say I blame them really. Occupying a corner spot on Villiers Street and Watergate Walk, the facade is relatively non-descript. Step inside, however, and it’s a whole different world. Down in the basement, the dark wood panelling overhead and on the walls make the rooms without many windows even darker. Hidden away in cave-like areas, people sit tucked away from prying eyes. The timber furniture looks and feels as though they’ve been around since this bar opened in 1890. It hasn’t of course, but it does well to support the atmosphere, and we thought it prudent to check their stability before we took a seat. The walls are adorned with newspaper clippings. The original items, also validating the age of the bar, have a strong monarchist theme. With a glass of wine in my hand, it was interesting to take a walk and read about Queen Elizabeth II’s coronation directly from the daily paper. It’s become quite an institution in the city of London having survived physically, especially through periods of bombing during world wars. It has also fought against the surging tide of commercialism, thwarting attempts to push it out of business. Back in the 1990s, aggressive landlords seeking much higher rents almost saw it close. Thankfully the community rallied around it, and it continues to serve regulars and visitors alike. It has stayed true to its origins, serving only wine and port. They have a casual selection of hot food, salads and cheese available for lunch. It’s all out on display, negating the need for a significant commercial kitchen and reducing the amount of time required to wait for food. It’s the perfect solution for a quick bite and a glass of wine. At Gordon’s Wine Bar, the have a keen focus on providing excellent cheese, so we were happy to take their suggestion, foregoing the daily roast for a selection of creamy cheese. There were three of us dining, so we thought a three cheese platter the most suitable arrangement. All cheese boards come with bread, pickles and relish. 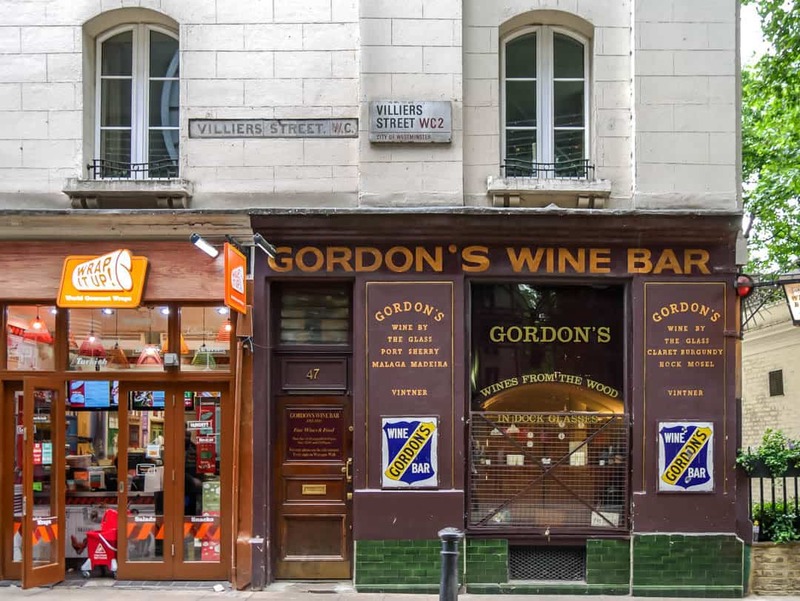 Gordon’s Bar is located at 47 Villiers St, London. The closest tube station is Embankment, a two-minute walk. Charing Cross Station is also a two minutes walk. We are always attracted to markets, with our favourite in London being the Borough Markets. The Leadenhall Market is well worth a visit. Built in the 14th century, the Manor of Leadenhall was built on an area used most commonly for trading. Later, the area expanded further into a fully fledged market selling poultry and cheese. As the area came alive, so to did the importance of the area and it attracted the attention of local businessmen and politicians. By the mid-1400s, it became known as the best place to buy all the fresh meat and produce a household required. 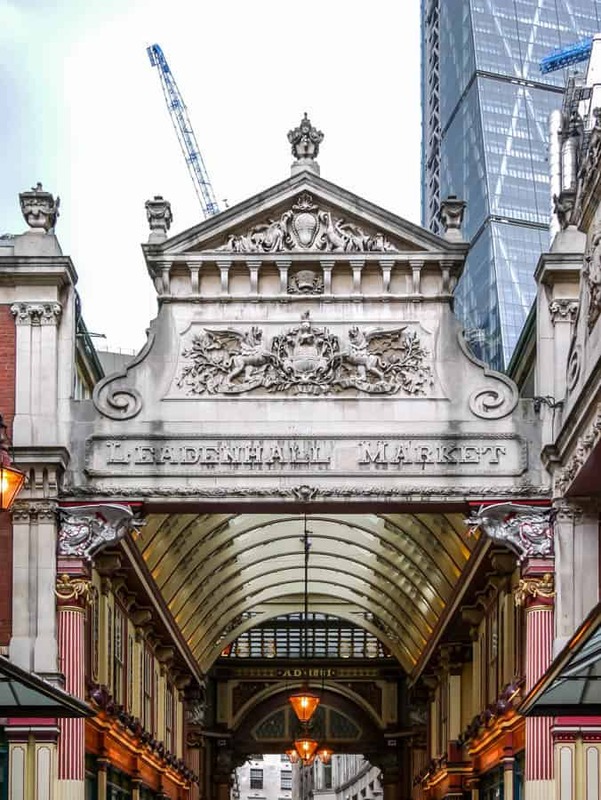 Initially built with a lead roof, lending itself to the name Leadenhall, in 1881, the building was given an extensive makeover in line with the Victorian architecture of the day. Wrought iron and glass were used extensively throughout, most notably for the stunning glass dome overhead. Today, the market no longer operates as it once did, making way for markets of a more modern kind. It has still kept its links to the past with cobbled streets and an immaculately maintained roof and building. We came here to admire not only the building but to eat in an area that has become synonymous with good food. During the week, the area is busy with the city business crowd. On Friday around midday, it’s almost standing room only as they filter out of their corporate offices and into the various pubs and bars. We chose to have a light bite with some tapas and a glass of rosé. It was also my first introduction to Tropea onions, what a treat! Eating in the Leadenhall market doesn’t cost the earth and can be done so efficiently if you need to be on your way quickly. The restaurants here are used to having the corporate lunches who settle in for hours, or equally those who only have a short time to spare. Leadenhall Market is located in Gracechurch St, London. The closest tube station is Monument, a four-minute walk. Bank Station is six minutes walk. Fenchurch and Cannon Street train stations are an eight-minute walk. Alternatively, you can walk from Tower Bridge which is on the other side of the river and 14 minutes away. When I read about Blacklock, a restaurant serving chops in the basement of an old brothel, I couldn’t resist making this one of the places we would stop to eat at. We timed it perfectly for a pre-show lunch on the famous Shaftesbury Avenue in Soho. These days, it’s no longer a damp, musty smelling abode operating in dubious circumstances, but a minimalist and industrial looking fitout. Owned by a young, former lawyer, Blacklock is a carnivore’s delight and will elicit a hasty retreat from vegetarians and anyone who didn’t realise this brothel is no longer. Apparently, that does happen, despite it having closed its doors in the 1990s. It’s known as a “chop-house”, with a small menu focussing on providing the best chops possible. I’d highly recommend starting off small with the pre-chop bites. It’s quite possibly the best opportunity also to eat something other than meat. As tasty as the pre-chop bites are, especially the egg and anchovy, we can’t wait for the main event. The choice isn’t so straightforward though. The menu might be simple in terms of its overall offering, but the devil is in the detail. Did we want pork chops, in loin, rib or belly varieties? Did we want lamb cutlets or lamb T-bone? For bacon lovers, there’s even a bacon chop. When it came to beef, our choices included prime rib, porterhouse or bone-in sirloin. or lamb chops? We could order “skinny” chops which were priced individually. The larger chops were priced in 100g portions which gave an indication of just how large these pieces of meat might actually be. With so many options swirling and with Stirling’s predilection to wanting one of everything, the “All in” caught our eye. Suddenly we had success for this was a sharing menu, with a selection of chops, flatbreads and sides as well as the pre-bites. If you are going to eat this much meat then we decided we were past the point of no return, so ordered the beef dropping chips to sit alongside the chops. We are in England after all too! The 10-hour ash-roasted sweet potato was soft, sweet and perfectly matched as well. For some freshness, or just to make us feel a little better, a fresh salad made its way onto the share plate. Our eyes must have been as big as the platter it was all served on as we watched them bring it out to our table. Chops of every colour, kind and description were piled high, with the juices all being caught by the flatbread on the bottom. They are every bit as delicious as they look and between three of us, we devour the entire lot. As Australians with very good access to incredible meat, it was great to see that a local producer from Cornwall is right at the centre of the Blacklock offering. Tip: If you are planning on visiting Blacklock on a weekend, it’s best to book. We arrived without a booking and the team here did a great job at finding us a table. Whilst there are several Blacklocks in London, we ate at the Soho restaurant. It is located at 24 Great Windmill Street, London. Piccadilly Circus tube station is a four-minute walk, whilst Oxford Circus and Leicester Square will take around six minutes.